From the Upper West Side to the farthest stretches of Queens, New York City is overflowing with bubble tea. And while Chinatown is no exception, with the most concentrated number of shops serving the tapioca pearl-filled concoctions, one place stands out in particular (for something entirely different). 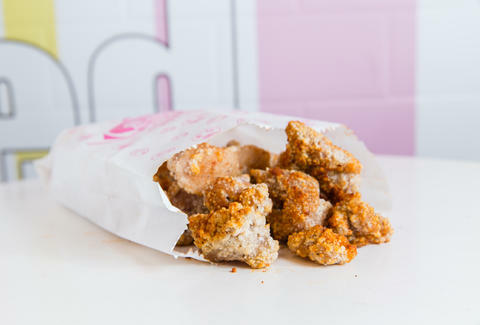 The best item on the menu at ViVi Bubble Tea, an NYC-based chain with locations scattered throughout the states, is the Taiwanese-style popcorn chicken served inside a paper bag. The popcorn chicken, which costs just $3.50 per order (cash only! ), is fried fresh, creating a light, but perfectly crispy coating around the tender meat. While there are five different flavors to choose from, the standard pepper-salt is by far the best -- simple, but perfectly seasoned. If you’re looking for something slightly more kicked-up, the heavily spiced curry flavor takes the unassuming chicken to a new level. These flavors, along with spicy, garlic, and basil, come served in a paper bag with two wooden sticks, so you can easily eat the snack-sized portions on the go.